Honors College Alumna, Teshamae S. Monteith, MD, ’98, was awarded the prestigious Torch Award last month. The Torch Award is the highest honor bestowed upon alumni and faculty by the FIU Alumni Association. It recognizes FIU supporters who are making positive impacts on their profession, the community and our university. 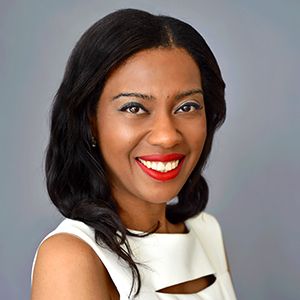 Dr. Teshamae Monteith is an Assistant Professor of Clinical Neurology at the University of Miami, Miller School of Medicine. After graduating with a Bachelor of Science degree in Biology, through the Honors College at Florida International University, she received a medical degree at the University of Miami, Miller School of Medicine. She completed Neurology residency at New York University and then pursued two fellowships in headache medicine at Thomas Jefferson University and University of California, San Francisco. She is currently the chief of the Headache Division and director of the headache fellowship. Dr. Monteith is a recipient of the American Academy of Neurology’s (AAN) Palatucci Advocacy Leadership Award and the American Headache Society’s Wolff award. She is a highly regarded lecturer, author of numerous publications, and has served on a number of advisory boards. Her research is in migraine, stroke, and imaging biomarkers, and has been funded by the NIH/NINDS.